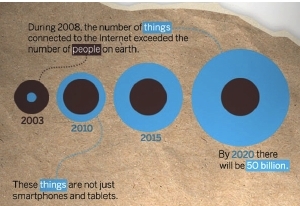 A new report from IDC concludes that the “Internet of Things” (i.e. connecting devices such as cell phones, environmental sensors or car computers) has reached a “tipping point” where it will have a major impact on government in areas such as health care, defense, the environment and transportation. It’s time to start a conversation about this transformation! IMO Interesting post which could have some interest to some! Hi David, thanks for creating this group (and sorry for being so slow to accept your kind invitation!). How do you begin getting your arms around starting a conversation in this space with government? What’s your point of entry? You’ve tackled so many complex topics over the year, I’m interested in seeing how you may approach this one.